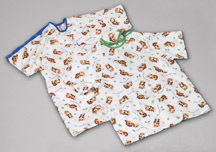 Our Tired Tiger Pediatric Line Keeps Your Little Patients. Smiling Your little patients will love our new Tired Tiger line of pediatric wear that features fun and friendly tigers resting quietly in the leaves. Made from comfortable 100% polyester woven fabric, these laundry-friendly items will hold up to high laundry temperatures better than brushed polyester fabrics, and are guaranteed to remain flame-retardant for the life of the garment. These deluxe-cut I.V. Sleeve gowns will fit a better range of sizes, and feature a straight-back closure with metal snaps at sleeves and back. These gowns also feature a color-coded binding down one sleeve to help end users easily identify which sleeves snap together.